In a great article, Matt Gemmell talks about some of the aspects of the new UI style in iOS 7, in comparison to iOS 6. He's got some very interesting insights. I especially liked the visual he created (in the image on the right) by putting a bunch of iOS 6 screens (left) next to iOS 7 screens (right). I think it clearly shows how dramatically different, and in my opinion better, the UI is in iOS 7. As widely expected, it sports a new interface aesthetic characterised by strong, simple lines, areas filled with flat or gradient colours, and a lack of ornamentation. I agree. 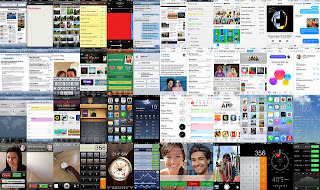 iOS 7's new UI design is an important and essential next step in iOS, and the mobile User eXperience (UX). A bright style that is more like interactive paper. A clean, mature and superior look that matches the superior style and quality of the Apple hardware it runs on. ...the reality of day to day usage is that you’ll spend time in apps. Where there were previously gloomy cubbyholes and low ceilings, there are now floor-to-ceiling windows, skylights, and clean surfaces. I love his comparison analog, that iOS 7 uses "floor-to-ceiling windows, skylights, and clean surfaces". 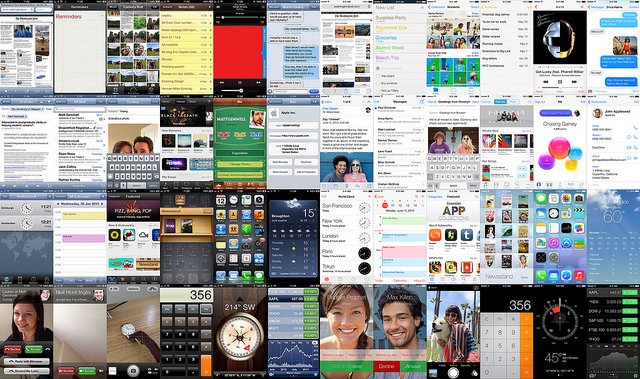 A must read article if you're interested in iOS 7 or mobile UX in general.